Women picking tea on an estate near Srimangal, the town at the centre of Sylhet’s large tea industry. Part of the exhibition River of Tea: From Bengal to Britain. A new exhibition is coming to Oldham, telling the untold story of how our love for a cup of tea has helped shape our towns and cities today. Gallery Oldham’s latest exhibition opens on 16 September. River Of Tea – From Bengal To Britain is an exhibition of photographs by Tim Smith. Tea enjoys a special place in British culture and the industry has played a key role in our history. Behind Britain’s cup of choice is a fascinating story that is rarely told; how the early tea trade sparked a migration that has helped to shape our towns and cities. Tim Smith is a photographer based in Bradford and for over 35 years he has worked with a range of communities to explore issues of migration and identity. For this new exhibition he has worked with the Bangladeshi community in Oldham and other British towns to explore the story of how the tea trade built early links between Britain, India and Bangladesh. Over 500,000 British-Bangladeshis now live in Britain. Over 90 per cent are of Sylheti origin, from a region in Bengal that was once part of Assam Province in British India. Sylhet now lies in northern Bangladesh, just south of India’s Assam State. The connections between Sylhet and Britain were forged when the British established tea plantations in Assam in the 1830s. They relied on river transport to get the tea from plantations to the port of Calcutta for export. It was the Sylhetis, master sailors and boat builders, who first provided this transport. Sylheti sailors then joined ships bringing the tea to Britain, and some of these sailors then found work ashore in Britain. It was these pioneers who laid the foundations of the communities of today. 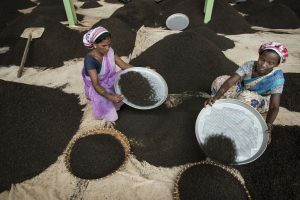 Women grading tea at the Tezpore and Gogra Tea Estate in Assam. The estate is owned by McLoed Russel, the world’s largest tea producing company. During the 1800s the British discovered Assamese people making a drink from a wild plant, which proved to be a variety of tea. India’s first tea estates were established in Assam, a region which has since become the world’s largest producer of tea. links with Britain and the impact these have had on people and places in Bangladesh. 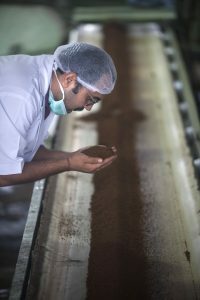 Tim said: “Drinking tea is such an important part of British, Indian and Bangladeshi culture, yet the story of how tea arrived in Britain and the people it brought with it is rarely told. “It was a real privilege for me to be able to retrace this journey. I photographed life along the rivers and in the tea estates of India and Bangladesh, in the bustling cities of Dhaka and Calcutta, and in Sylhet itself where I met loads of people from all over Britain. Cllr Barbara Brownridge, Cabinet Member for Neighbourhoods and Co-operatives, said: “We all love a cup of tea but most of us probably never stop to think about where it comes from and what impact it has had on our country. River of Tea opens on 16 September and runs until 6 January. After this launch in Oldham the show will tour to several other venues around the UK. The exhibition is supported with funding from Arts Council England. Join Tim Smith for a talk in the exhibition on 20 September at 2pm. Man smelling the quality of tea on the Monabarie Tea Estate in Assam. Owned by McLoed Russel this is the largest tea estate in Asia. During the 1800s the British discovered Assamese people making a drink from a wild plant, which proved to be a variety of tea. 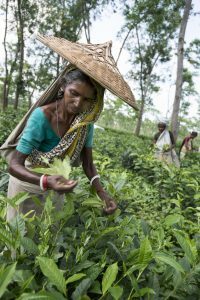 India’s first tea estates were established in Assam, a region which has since become the world’s largest producer of tea.